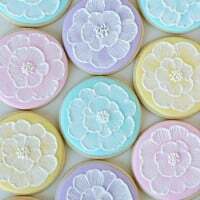 These sweet little Spring Tea Party Cookies would be perfect for most any special occasion! 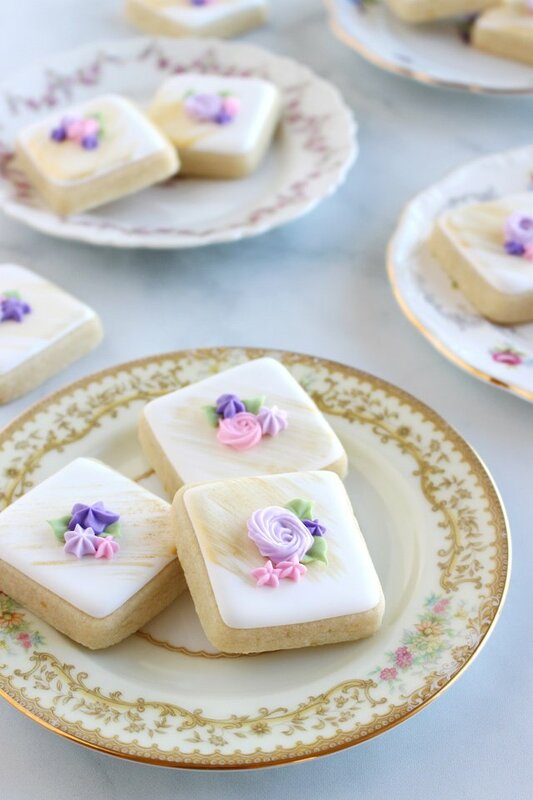 Initially I made these with my Grandmother’s 95th birthday party in mind, but I think they’d be just perfect for Easter, Mother’s Day or a pretty tea party too! 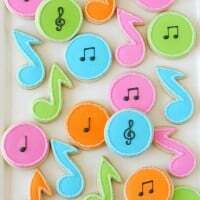 Of course you could adjust this design to include any color flowers, or even a colored base icing (instead of white). 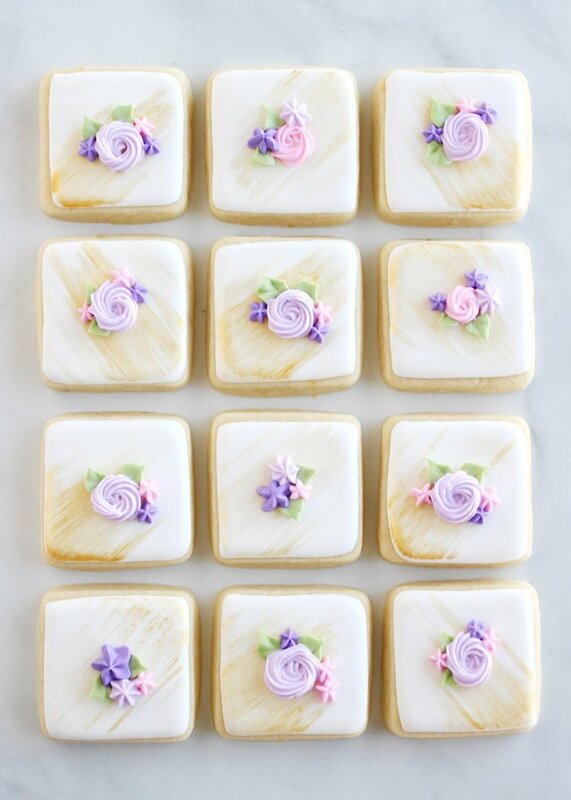 I just loved the simple, elegant look of these pretty spring cookies! Continue scrolling down through this post to find a step by step decorating video. You’ll need a batch of cookies using my Perfect Sugar Cookie Recipe. 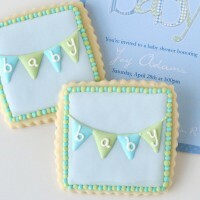 I used a set of round edged Square Cookie Cutters for the cookies shown. Then you’ll need a batch of royal icing using my Royal Icing Recipe (this link includes a very basic royal icing tutorial as well). Notes -I added 2 teaspoons of fresh lemon zest to the cookie recipe for this batch, and for the royal icing I used fresh lemon juice in place of most of the water. Both of these adjustments are totally optional. Outline the cookie in white outline icing (this should be about the consistency of toothpaste). Immediately fill in/flood with white flood icing (about the consistency of shampoo). Set cookies in front of a fan set on low for 1-2 hours, then leave cookies out to dry another 4-8 hours until the base icing is fully set. I outline and flood with either tipless piping bags (as shown in the video in this post) or Wilton piping bags fitted with a PME #1.5 tip for outlining and Wilton #2 tip for flooding. For the gold accent… I mixed gold luster dust with Everclear to create a gold liquid, then I used a fan brush to swipe across the cookie on a diagonal angle. In place of Everclear you can mix luster dust with clear vanilla extract, vodka, or another clear (high proof) alcohol. 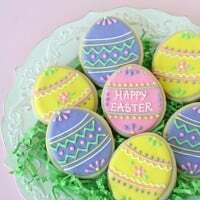 The alcohol evaporates off the cookie very quickly, leaving the desired color, but no taste. Allow the gold accent to dry (in front of a fan) for at least 15 minutes before adding the flowers and leaves. 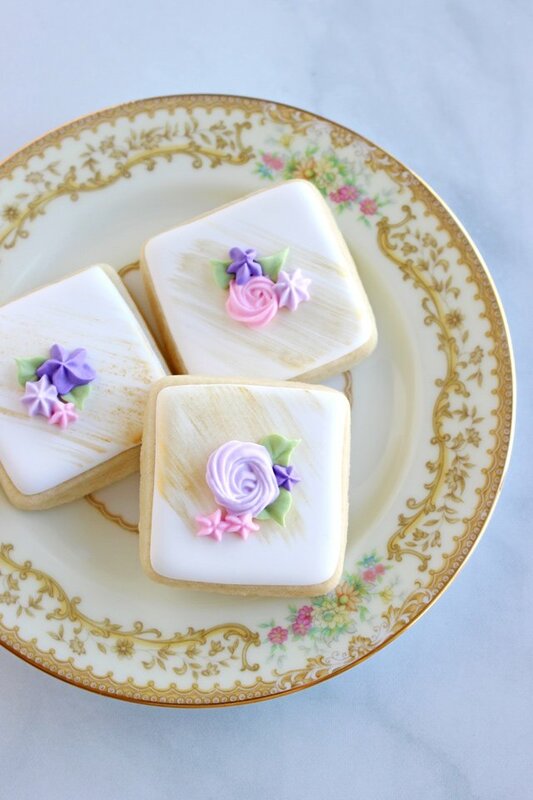 For the flowers and leaves… you’ll want to use thick royal icing and a variety of star tips. The icing should be thicker than outlining icing. 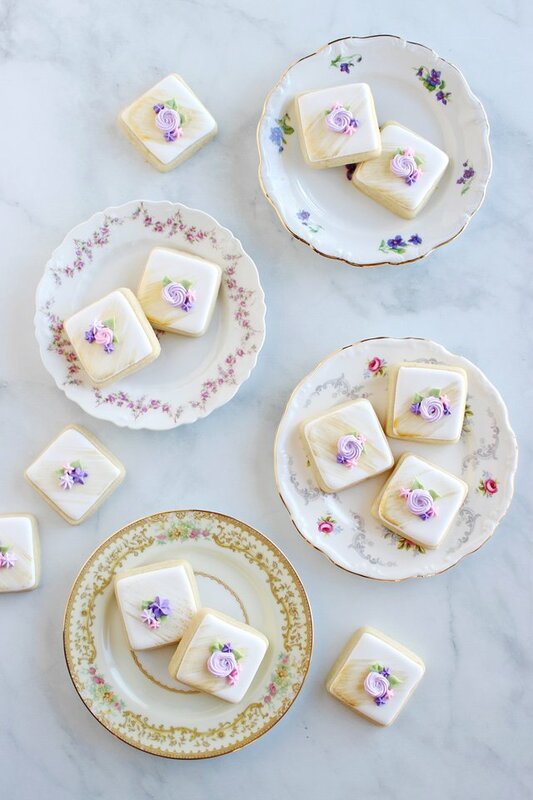 The icing should be thick enough to keep its shape perfectly without looking like the definition of the flowers is “melting”, but the icing should not be so thick that it’s difficult to squeeze from the piping bag. If it’s hurting your hand to squeeze the bag, it’s likely too thick. For the leaves I used a tipless piping bag cut into a leaf tip, or feel free to use a Wilton tip #352. Pipe the leaves first, then allow those to dry (in front of a fan) for 5-10 minutes before adding the flowers. For the flowers I used Wilton tips #18 and #14. The leaf and flower colors were created with a Americolor gel colors. I know the green leaves are Americolor Avocado, but the pinks and purples I didn’t take notes on. I generally save icing (in the fridge) between decorating sessions, so often I start with a color I mixed a week or more ago, and then add fresh white icing and color as needed. So it’s very difficult to give you an exact formula. Looking for more tea party inspiration? Such pretty dainty flowers! And, I’m digging that you used the lemon flavoring! BEAUTIFUL!!! Love all your decorating! I just love all your lovely creations! Are these packaged individually and sold? No, I do not sell my cookies. I am sharing them here to teach anyone who would like to learn to make their own.